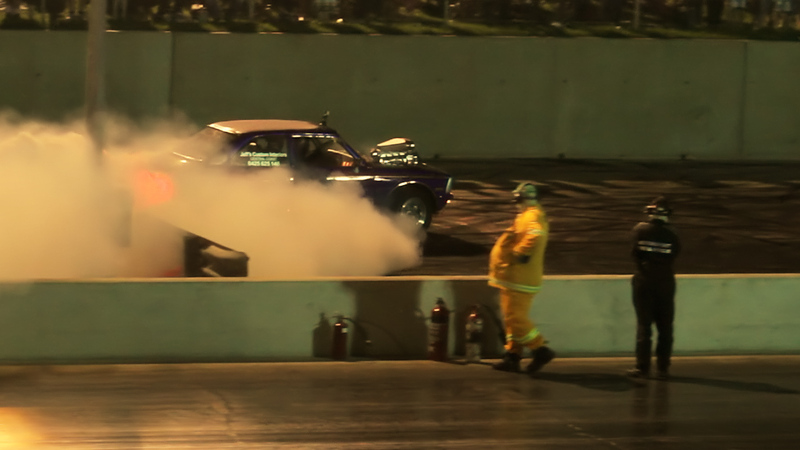 Mick Brasher in ULEGAL wows the stadium in "The Colosseum"
'Mad' Mick Brasher, the mad part I can certainly vouch for, I met the guy while filming this clip for him at Hidden Valley drag strip last year. You would be mistaken though if you thought that was his daily composure I was talking about. Wild looks aside, Mick Brasher is one of the friendliest blokes you could talk to, always with a laugh and a smile not too far from his face (the guy has so many fans to meet this it is probably just as well he has such a personable demeanour). No the 'Mad' I am talking about surfaces when he steps in behind the wheel of his crazy burnout car 'ULEGAL'. Akin to a whirling dervish when posessed, Mick and ULEGAL effortlessly create an insane dance on burnout pads across Australia. It's well known Aussie audiences love their 'skids' and ULEGAL is a crowd favourite wherever it goes. "MAD [adjective]: mentally disturbed; deranged; insane; demented."